Synopsis (from the publisher): What if everything you thought you knew turned out to be a lie? Everything is perfect until the morning Alice arrives at work to find the gallery gone—the space stripped bare as if it had never been there—and Drew Campbell's dead body on the floor. 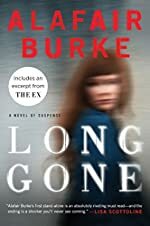 Overnight, Alice's dream job has vanished, and she finds herself at the center of a police investigation, with the evidence mounting against her. The phone number Drew gave her links back to a disposable phone. The artist whose work she displayed doesn't seem to exist. And the dead man she claims is Drew has been identified as someone else. When police discover ties between the gallery and a missing girl, Alice knows she's been set up. Now she has to prove it—a dangerous search for answers that will entangle her in a dark, high-tech criminal conspiracy and force her to unearth long-hidden secrets involving her own family ... secrets that could cost Alice her life.